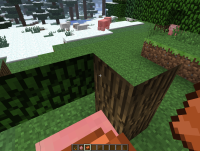 When riding on a pig or horse I can pass through blocks where the rider should be. When this happens my head sometimes gets stuck in a block and I take suffocation damage. MC-14282 Head in blocks... Horse's fault! MC-17110 when on horse i go through leaves ? MC-19361 When you ride a horse, it lets you travel through stuff. MC-42204 Baby zombie pigmen on chickens glitch into walls and suffer damage. MC-47867 Horses with players can pass through places that only fit players. MC-106259 When you are on a horse , you can go trough leaves.